This one na gobe! Embattled Senate President Bukola Saraki was receiving monthly salaries from Kwara state government even after he left office and became a senator, Mr Michael Wetkas, a top detective with the Economic and Financial Crimes Commission (EFCC), further revealed. While giving his testimony at the Code of Conduct Tribunal on Wednesday, Wetkas disclosed that Saraki was receiving monthly salaries from June 2011, when he left office as governor of Kwara state, to as far as August 2015 while he was a senator. “In the course of our investigation, we wrote to Access Bank for them to give us details of the salary account of the defendant. The salary that was coming into the account was N254,212 as of 1 August 2007. “As of June 3, 2011, the salary was N291,124. On July 4, there was another payment with the narration Kwara State Government (KSG) June 2011 salary. The amount was N572,286. 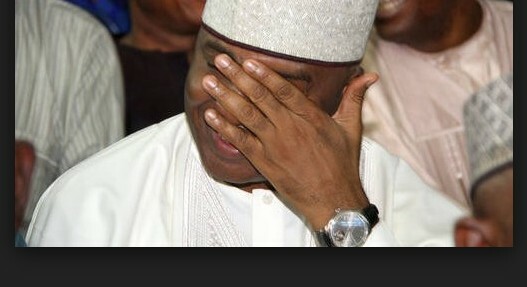 “On August 29,2011, there was another payment in the sum of N744,002 from the Kwara state government. “On September 29,2011 there was another payment of N743, 942 with the narration salary payment from KSG. “On October 27, 2011, there was another payment of N1, 165, 468 for salary. “In November 2011, there was payment of the same amount. The narration was December pension. “On February 1, 2012, there was payment of the same amount with the narration for pension. Wetkas had earlier detailed how Saraki allegedly used fictitious names to launder Billions of Naira.